Irises are a genus of 260 – 300 species of flowering plants that have showy flowers. They get their name from the greek word for rainbow which refers to the wide variety of flower colours which are found among the many species. Nearly all species are found in temperate Northern hemisphere zones, from Europe to Asia and across North America. 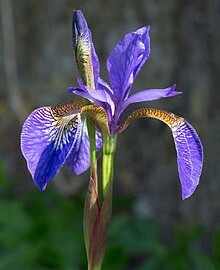 Although diverse in ecology, Iris is predominantly found in dry, semi-desert, or colder rocky mountainous areas. Other habitats that irises are found include grassy slopes, meadowlands, bogs and riverbanks. So can rabbits eat irises? Irises and their bulbs are unfortunately poisonous to rabbits and will harm them if they are eaten.